A little while ago, we presented you a piece on the all-new Pal-V Liberty; a flying car that you could actually purchase and use to skip over all of those annoying traffic jams – providing you had a sufficient runway. Now, however, Audi, Italdesign and Airbus have unveiled a new flying vehicle concept that would combat the runway problem. It’s called ‘Pop.Up Next’ and it’s a concept that approaches the world of flying cars with a more modular stance; combatting the issue of permanently carrying flying gadgetry but still allowing you the ability to fly your way out of standstill traffic. Designed for a time that the three brands call ‘the distant future’, Pop.Up Next is entirely autonomous, operates solely through the use of speech and facial recognition and is powered exclusively by electricity. Unlike previous flying car concepts, Pop.Up Next is built around a two-seat passenger compartment that can be attached to either four wheels for ground travel or a drone-like four-propeller system for air travel. Once attached to the latter, Pop.Up Next is capable of vertical take-off and landing (VTOL), like a helicopter, making it perfect for use within busy cities and therefore, Italdesign say, reducing the traffic problem that faces the world’s major city centres. Similar to many solely autonomous vehicles that we’ve seen over the years, the interior of Pop.Up Next focuses entirely on a 49-inch screen that keeps occupants up-to-date with everything that is happening in the world. Designed by Italdesign, people interact with the screen through speech, facial recognition, clever eye-tracking technology and touch functionality. Ensuring peace and quiet in the city of the future, both land and air powertrains are entirely electrified. For air travel, Airbus have equipped Pop.Up Next with four twin-electric motors that offer 60km worth of range, a charging time of just 15 minutes and a top speed of 120km/h. Audi have taken up the task of ground mobility, equipping Pop.Up Next with an electric battery and motor that has a range of 130km, a top speed of 100km/h and a charging time of just 15 minutes. Following the same ethos as many solely autonomous concepts, it looks like the three brands envisage Pop.Up Next being part of a mobility service, rather than a vehicle that you would actually own. 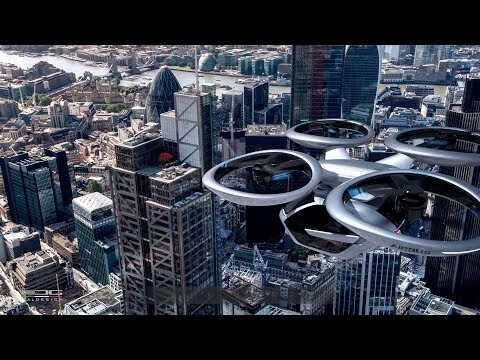 That would mean that you could take a flight on an Airbus aircraft and, instead of waiting in any taxi lines, jump straight into your pre-booked flying car to complete the journey traffic free. With more-and-more flying car concepts appearing, we’re not entirely sure just how traffic free the skies will be, but we’re excited to see what the future holds nonetheless. What do you think of this new concept from Audi, Italdesign and Airbus? We’d like to read your thoughts on Facebook, Twitter and Linkedin. Pal-V have unveiled 'Liberty' the first flying car that you can actually buy. Here are some of our highlights from another exciting Geneva Motor Show.